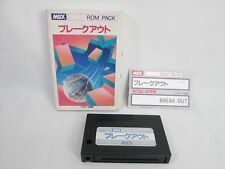 This patch allows to play 3D Tennis (ASCII) with Japanese font on any MSX. This is a patch to fix PSG I/O ports and get Japanese characters on any MSX. Akumajou Dracula (Vampire Killer) patches for JoySNES. Patches that allow to play to Akumajou Dracula (Vampire Killer) on MSX with the 8 buttons of a SNES controller using JoySNES adapter. Joystick was supported in game but not in selection menu. It is especially inconvenient when using a wireless controller. That's why I made these patches that that allows to start a game with joystick. Usage is as shown below. Press button 1 of joystick 1 to one player game. Press button 1 of joystick 2 to two players game. A patch for the game Bubble Bobble. Joystick was supported in game but not in selection menu. It is especially inconvenient when using a wireless controller. That's why I made these patches that that allows to start a game with joystick. It fixes also PSG I/O ports direction. 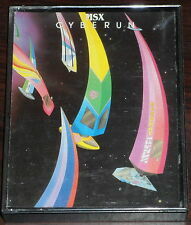 D.A.S.S., the impressive shoot'em-up from MSX-Engine is often regarded as a very difficult game. This patch gives you some extra continues and makes the game a bit less difficult. This patch removes protection and improve the compatibily with MSXs. 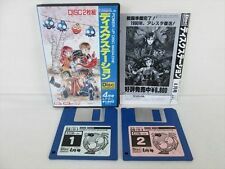 The 3 disks in this archive contain the patch to turn Find it into a better looking Find it for MSX 2+ and MSX turbo R.